Despite a rather long absence from such matters, we haven't forgotten that we're still in the midst of reviewing Perl 6 Coding Contest 2011 code submissions. The t4 task was of the puzzle kind. See the post about counting t4 configurations for some overview of the static parts of the problem. in by that other piece. in its movement by the current positions of the other pieces. * A piece may not rotate, move sideways, or otherwise leave its groove. long as they don't overlap). with a piece at l1 and l2 (written as "l12"). We call this piece the "bullet". The goal is to slide the bullet to l56, through a valid sequence of moves. Thus, other pieces may have to be moved in order to get the bullet to l56. ..  ..  ..  ..  ..
..  ..  ..  ..  ..  ..
Write a program that accepts an initial board configuration on standard input. even more important success metric than minimal solutions. We trivially notice that in order to get the bullet (the l piece) across, we need to move aside the e piece and the c piece. But in the starting configuration, both of these pieces are blocked by other pieces. So we must move them first. And so on. Reasoning about this kind of board takes place in a backwards manner. We figure out which pieces we have to move out of the way to be able to move the pieces we are really interested in. We follow the dependencies backwards until we bottom out. In this particular problem, it's a bit worse than that: the two subproblems of "move aside the e piece" and "move aside the c piece" interact. Why? 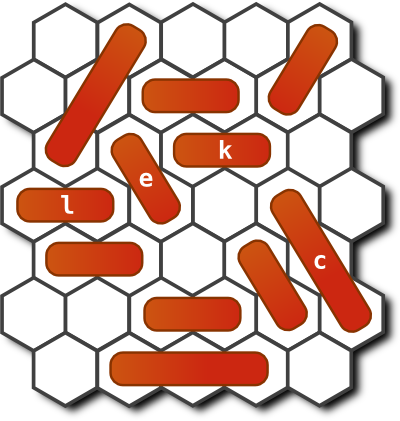 Because the c piece is blocked by the k piece, which is blocked by the e piece. So we can't just solve the subproblems in any order we like, we have to find a way to solve them that works. The whole thing has a feel of people attempting to execute a ballet number in a crowded elevator. It's exquisite. It's frustrating. So, people solve this problem by reasoning backwards. This is the only working approach I've seen, and I've talked to quite a few people about this problem. How should a machine solve it? This is fine. It's slow, but it's fine. What some of our contestants ended up doing was to improve on this by using A* search to guide the search. A perfect fit, it seems, for this kind of problem. The extra complexity from upgrading from BFS to A* is paid back in spades by the problems being solved faster. A success story. The other possible approach, which none of the submitted entries attempted, is to do the reasoning about blocking dependencies much in the way humans do. Though such a solution is certainly possible, I have a creeping suspicion that it would be far more complex than the A* approach. It's unclear how many special cases it would need to contain in order to work out all the dependencies. One gets a bit of extra respect at the pattern-matching and hypothetical-future algorithms in one's own brain when trying to code up the same things as a program. Be that as it may. Have a look at people's solutions. Admire people's ingenuity on this one. Even though virtually everyone solves the problem in the same way, there's no end to how differently they factor their solutions.